After years of rampant, unsolved hit-and-runs that have made this the City of Fallen Angels, Los Angeles is finally getting tough on fleeing drivers. Streetsblog reports LA will establish its own Amber Alert-style emergency notification system after Governor Brown vetoed a similar statewide system last year. Alerts will be sent out on social media, including Facebook and Twitter, to warn the public to be on the lookout for drivers responsible for serious hit-and-runs. In addition, the city is establishing a standing reward for information leading to the conviction of runaway drivers, ranging from $1,000 for a collision resulting in property damage with no injuries, up to $50,000 for fatal collisions. It won’t remove the incentive to flee. But maybe if more drivers are convicted of the crime, others may think twice about flooring it following a wreck. William Donald Johnson has been convicted in the allegedly booze and drug-fueled hit-and-run death of cyclist Phillip Richards in Calimesa at the end of 2013. He reportedly fled the scene after crossing the center line to hit Richards head-on. Johnson faces up to 15 well-deserved years in prison. 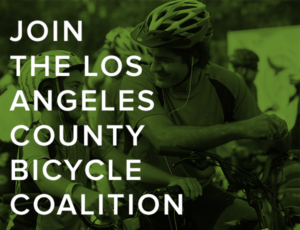 The next Bicycle Roundtable is scheduled for 6:30 pm this Thursday at Metro headquarters. 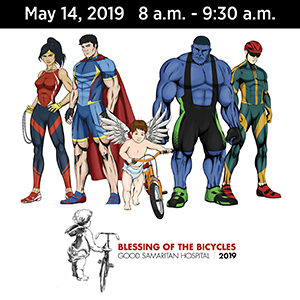 The agenda includes updates on bike share, bike platform symbols and complete streets policy; the latter earned them national recognition for last year’s efforts. A USC student was hit by a car while she was riding in a marked intersection near campus, while those darn cops refuse to play fair, hiding behind cars and trees to catch law-breaking Trojans. Ciclavalley examines the Forest Lawn Death Trap as part of a series on the worst bike lanes in Los Angeles. Which sadly seems to be a much longer list than the best ones. South Pasadena’s Monterey Road may be up for a road diet. San Diego finally hit the on switch for its long-delayed bike share system. A salmon cyclist suffers two broken wrists in Brea collision when she’s hit by a car pulling out of a parking lot; drivers seldom look for anyone coming against traffic. Participation will be off at this weekend’s Tour de Palm Springs due to a lack of available hotel rooms, while riders taking part in the tour may have to wait for the presidential motorcade to pass. A Texas man and his dog bike from Main to Monterey the long way. An Anchorage man averaged a speedy six mph on a 225 mile fat bike race along the frozen Iditarod trail. Someone is removing ghost bikes from the streets of Houston. But at least the city is getting green lanes downtown. Only 18 bicyclists have been injured using Chicago’s bike share system since it was introduced 2-1/2 years and 3.2 million rides ago. Meanwhile, Cincinnati’s successful bike share is expanding into neighboring Kentucky. The seemingly endless battle of bikeways versus parking rears its ugly head once again, this time from St. Paul business owners. Because only motorists could conceivably spend money, not bike riders. Right? Wisconsin’s conservative governor takes aim at funding for bike and pedestrian projects. Stickers saying “I parked in a bike lane” are called too passive aggressive for New Yorkers, who are more likely to simply bash a windshield with a U-lock according to one Gotham cyclist. How to ride a Mississippi roundabout. A road raging West Palm Beach driver intentionally crashes into a bike rider, then gets out and punches him, apparently just for being in his way. An Orlando writer discovers biking to work is more fun than driving, though a DC writer might disagree after giving up biking to work following a solo crash he can’t remember. A look at the history of bicycling superhighways, both real and vaporware, starting with the elevated bikeway that eventually became LA’s first freeway. Meanwhile, City Lab criticizes all those farfetched plans to remove bikes from the streets, because it’s not the bikes that are the problem. Safety fears keep British kids from bicycling. London cyclists stage another massive die-in to call for safety. Talk about distracted driving. A Scottish driver is photographed using headphones, a mobile phone and a laptop computer while he drove, all at the same time. Greg LeMond handicaps this year’s Tour de France, saying Froome is the favorite but don’t Quintana count out. And says cycling needed Lance to crash and burn. A cold-hearted Aussie woman actually bragged to family and friends about fleeing the scene after hitting a bike rider, leaving him to die of hypothermia in a ditch. Caught on video: riding on top of a car may be taking sharing an Australian road just a tad too far. You might have to wait awhile to print your own bike, at least if you actually want to ride it. And Walmart’s newest bicycle shaped objects are assembled in the US from foreign-made parts, while Scottish kilts come from Long Beach, courtesy of a cyclist who evidently wanted to air things out after a hard ride. We have a lot to catch up on after this weekend’s breaking news, starting with a new e-book from one of LA’s leading bike writers. If you’ve been following this site for awhile, you’ll know that we link to pieces written by my friend Richard Risemberg of Bicycle Fixation on almost a daily basis, whether on his own site, or as a guest writer for Flying Pigeon and Orange 20 Bikes. 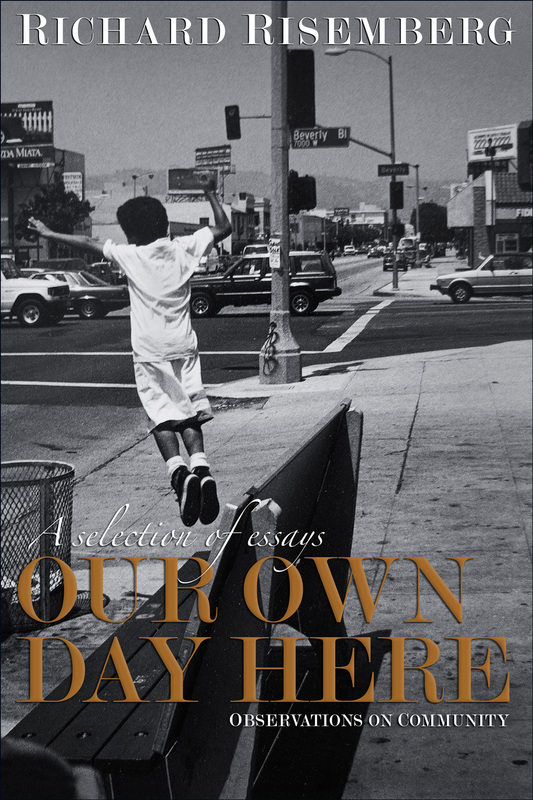 Now he’s collected some of his best essays for the new volume, Our Own Day Here. Among the subjects covered in these sometimes poetic, sometime humorous essays are cars, transit and bicycling, economics and politics, development, as well as the sense of place and the places that make it happen. As he notes, some of the pieces have appeared on various websites, as well as in the pages of local and national publications, while others have never seen print or pixels before. I haven’t had a chance to read it myself yet, though I hope to offer at least a partial review soon. But knowing Rick, and the insightful quality of his writing, I’d highly recommend giving it a read. Especially at the low download price of just $4.99 — with a 10% discount through Smashwords with the code BU84L through the end of August. It’s also available through Apple’s iTunes Store, and for Kindle through Amazon. The driver charged with killing popular Beaumont cyclist Phillip Richards has been found guilty on charges stemming from the fatal hit-and-run. Jurors convicted William Donald Johnson of both gross vehicular manslaughter while under the influence and hit-and-run causing injury, with enhancements for leaving the scene of a collision and causing great bodily injury. However, the jurors split on an additional murder charge; the Riverside County DA is unsure if he will be retried on that charge. He will be sentenced October 3rd; no word yet on how much time he faces. Johnson’s wife Kari had previously pled guilty to aiding in Johnson’s escape in the hit-and-run, and was sentenced to 90 days in jail and three years probation. Tragically, the bike rider most seriously injured in that wrong-way collision on San Diego’s Fiesta Island that sent eight cyclists to the hospital is paralyzed from the chest down as a result. Meanwhile, the driver responsible pled not guilty to felony DUI with injury and possession of a controlled substance after meth was found hidden in a very private place. That other notable cyclist from my hometown sets out today to win his second USA Pro Challenge, while Jens Voigt says this will be his last pro tour after 33 years. Caught on video: A nasty crash in the Eneco Tour takes out Italian cyclist Eugenio Alafaci, as well as the cameraman filming it. And former world champ Mario Cipollini is hospitalized after a car turns in front of him on a training ride. CityMetric looks at a tale of two bike lanes on North and South Figueroa. A virtually unrecognizable Kesha goes for a bike ride on Venice Beach. LAist offers photos from the opening of the Levi’s Commuter pop-up in DTLA. Now you, too, can slug your java from an Every Lane is a Bike Lane mug. Streetsblog and Santa Monica Next will host a forum for SaMo city council candidates next month. The San Gabriel City Council holds a special session on Tuesday (pdf) to discuss the city’s proposed bike plan. A Desert Hot Springs man is under arrest after police found him riding with bolt cutters on a stolen bike. And it wasn’t even the one he was seen stealing on surveillance video. Sad news, as the San Francisco bike rider seriously injured in a collision with a fleeing car thief last month was taken off life support on Saturday. After his custom-made bike is stolen, Redding residents pitch in to help a developmentally disabled man build a new one. Our slow cycling, casually dressed president goes for a family bike ride on Martha’s Vineyard. An OpEd writer for the New York Times reminisces on her life on two wheels, while a writer for Crain’s New York, who lost his own son in a bicycling collision seven years ago, explains the city’s new Vision Zero policy. The New York Post applauds the NYPD’s crackdown on cyclists who “terrorize pedestrians and endanger life and limb,” and calls on the city to make it permanent. On the other hand, they seem to be fine with the lawbreaking drivers who kill a hell of a lot more people than cyclists ever could. Caught on video: Continuing today’s New York theme, an NYPD officer is caught leaning in to deliberately block a bike lane, evidently just for the hell of it. Finally leaving Gotham, a Maryland cyclist pens a powerful open letter to the hit-and-run driver who cracked his ribs and ran his bike over. CNN lists the world’s best cycling cities; only one US city is on the list. And no, it ain’t LA. A Montreal office building cuts a cyclist’s lock and impounds her bike, even though it was parked on public property; if they have such a problem with parked bikes, maybe they should put in a decent bike rack. Britain’s Top Gear host calls for separated bike lanes and greater tolerance on the roads. Turns out cyclists are human beings, too. Who could have imagined? At least they’re showing an even hand, as Aussie police target scofflaw cyclists and the law-breaking drivers who pose the greatest risk to them and others. Breckenridge CO hosts a replica of the Eiffel Tower made entirely of bike parts. And Ford learns the hard way that using a convicted bike doper probably isn’t the best way to market their cars. A Pasadena cyclist walking his bike barely avoided serious injury when he was attacked by three apparently road raging dogs. He was smart enough to place his bike between himself and the raging pit bulls, then jumped onto the hood of a car for protection. Police shot all three dogs, killing one; the rider suffered minor bite punctures. If they shot humans for attacking cyclists, there might not be many drivers left. Horrifying video footage shows a car fleeing police in Laguna Beach with a bicycle dangling from its side, leading to speculation that it was a hit-and-run. Fortunately, no victim has yet appeared. Other reports suggest the bike may have started out on a rack on the car before it was knocked off in the pursuit. Thanks to Steve Messer and sonofabike for the heads-up. KTLA-5 offers a look at Ghost Bikes. Maybe if more people understand what they are, we might not need so many of them. Thanks to Lois Horwitz for the link. Charges in the case of Donald Johnson, the Calimesa driver arrested for the hit-and-run death of Philip Richards earlier this month, have been upgraded to gross vehicular manslaughter and fleeing the scene of a vehicular manslaughter; bond has been increased to $1 million. In addition, his wife, Kerri Johnson, has been arrested on a charge of accessory after the fact for aiding in the coverup. Bikes lanes are now a near certainty on the Glendale-Hyperion bridge, after serious blowback from pissed off advocates; now the fight is to get sidewalks on both sides. Bicycle Fixation’s Rick Risemberg gets it; whatever you wear to ride — or play social games — is okay. On the other hand, the LAPD clearly doesn’t. The next Metro Bicycle Roundtable is scheduled for Tuesday, February 11th. Former DA and current mayoral dad Gil Garcetti talks Paris: Women & Bicycles. Yes, you really can live car-free in Los Angeles. Pedicabs could be coming to Hollywood and San Pedro; a previous trial in Westwood failed, just like every other business seems to do there sooner or later. UCLA Bicycle Academy rightfully demands better safety and access; but is anyone listening? The LACBC’s Operation Firefly distributes bike lights in Long Beach. Hawthorne approves $11 million renovation of Hawthorne Blvd, including bike lanes; thanks to Margaret for the tip. Independent review says Caltrans is out of date, operating out of a culture of fear and acting too much like the highway department it is and not the mobility department it should be; I could have told them that. Newport Beach’s proposed bike plan can now be viewed online. San Diego’s planned bike share program has been delayed until Spring; it should still beat LA’s by a few years, at least. San Francisco woman does everything wrong, but still gets her stolen bike back — $260 later. San Francisco’s cycle tracks are paving the way for safer cycling throughout the state. Caltrans approves $2.7 million for a Monterey bike lane. Mountain View man is busted with a truck full of hot bikes. A Redding man is seriously injured in a possible BUI solo crash. New bi-partisan bill in Congress would bring equity to bike and pedestrian funding, as well as boosting funding for bike and pedestrian projects in low income communities. It takes a real schmuck to steal a bike from someone suffering from Parkinson’s. The law is stacked against bike riders in Alaska; there are reasons Alaskans ride year round, though. Wounded warriors mountain bike to recovery in Las Vegas. Fear and loathing in Las Vegas, as a German reporter attempts to cover CES by bike. The hit-and-run victim killed near my hometown turns out to be a gifted elected motor scientist who could breath fire; no, really. The good get better, as Denver bridges gaps for cyclists and pedestrians. Fort Bliss Afghan vet rides his way back from battlefield injuries. Infamous bike lane hater and tweeter Anthony Weiner now rides them; bike lanes, not tweets. NYPD targets drivers and jaywalkers in a traffic safety crackdown; evidently, cyclists are still fair game. Freezing temperatures don’t stop DC cyclists. Baltimore police ignore evidence and the law to illegally blame a bicyclists. A Chattanooga cyclist takes the local paper to task in the wake of a teenage assault on a bike rider. The Vancouver bike rider assaulted by a road raging driver tells his side of the story. The death of a British cyclist has turned into a murder investigation. London finally bans large trucks without pedestrian and cyclist safety features; vehicles that kill by design should never be allowed on the road, anywhere. Forty-two-year old Chris Horner, the oldest Grand Tour winner, gets a ride for 2014. Spanish cyclist riding through Pakistan denies reports six policemen were killed protecting him. Family of Japanese woman killed in collision with cyclist awarded equivalent of nearly half-a-million dollars. Sydney’s bi-directional bikeways take the wrong path. 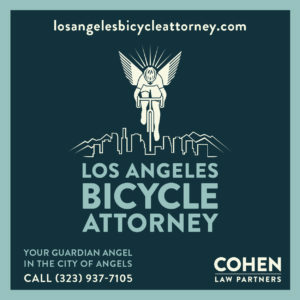 Finally, outgoing County Supervisor Zev Yaroslovsky profiles LACBC board member, bike advocate and alternative transportation fan Greg Laemmle; they couldn’t feature a nicer or more deserving guy. According to a report on Don Davidson’s Facebook page, Phil Richards has died of the injuries he suffered in a Calimesa hit-and-run just before New Years. I’m deeply saddened to share the news that my very dear friend Phil Richards passed away at 5 p.m. today. I send my sincerest thanks to everyone who offered prayers, love and support to Phil, his wife Annette and their family during the difficult days since his accident Dec. 29. Words cannot express what he meant to me and how he shaped my life. … He will be deeply missed. 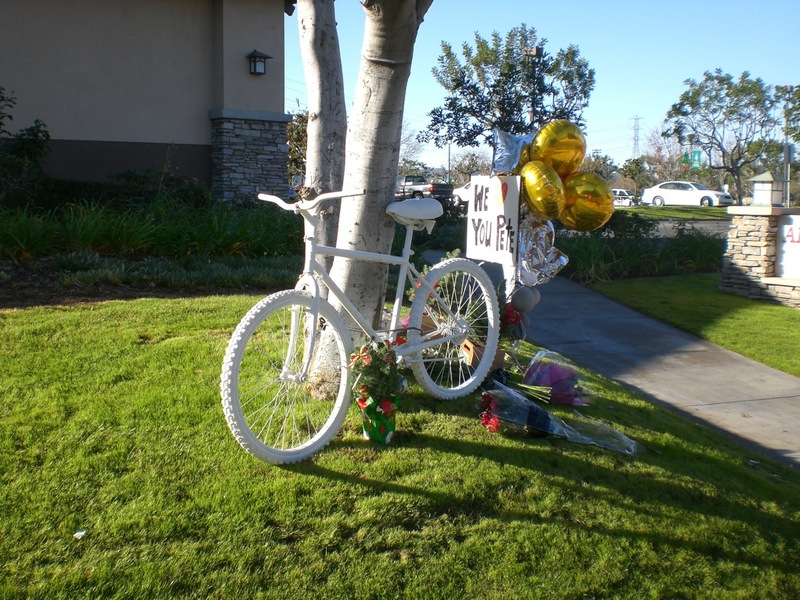 As you may recall, Richards was riding south on Calimesa Blvd just north of Singleton Rd around 12:25 pm on Sunday, December 29th, when a car allegedly driven by 42-year old Calimesa resident William Donald Johnson crossed the centerline and hit Richards head-on at an estimated 50 mph. Johnson fled the scene, leaving his victim critically injured in the roadway. The experienced 55/60+ racer underwent a number of surgeries over the past few weeks, but ultimately, his medical team was unable to save him. Hopefully, the felony hit-and-run charge against Johnson will be upgraded to a homicide charge. 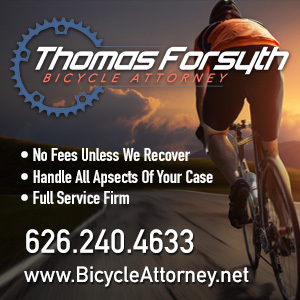 This is the 89th bicycling fatality in Southern California resulting from injuries suffered in 2013, and the 12th in Riverside County. My deepest sympathy and prayers for Phil Richards and all his family and loved ones. Update: The San Bernardino Sun says Richards was a 64-year old resident of Beaumont. This is not what I wanted to write about today. I was hoping to end this year on a positive note. But maybe the good news is simply that this bloody year, with its epidemic of hit-and-runs and far too many cyclists killed or injured, is finally coming to an end. And maybe the new year that starts tomorrow will be a better one for all of us. 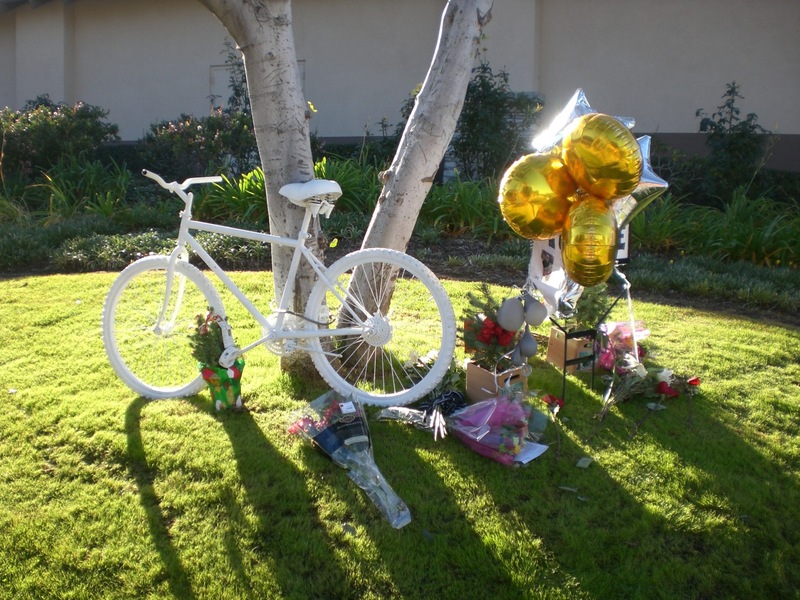 News broke today that a cyclist in Calimesa suffered major injuries in a Sunday hit-and-run. According to the Riverside County Sheriff’s Department, the bike rider was riding south on Calimesa Blvd just north of Singleton Rd in the small town east of Redlands and Moreno Valley around 12:25 pm. Witnesses saw a northbound car drift over the centerline and hit the rider head-on before fleeing the scene. The victim was identified on Don Davidson’s Facebook page as Phil Richards, but it does not mention his age or residence. In a second Facebook post, he said Richardson coded overnight after spending Sunday afternoon in surgery for multiple injuries, but was revived and in surgery again on Monday morning to stop internal bleeding and relieve pressure in his abdomen. Fortunately, he does not appear to have suffered head or spinal injuries — remarkably, since he was reportedly hit at 50 mph. The car reportedly struck Richards on the left front, damaging the car’s left side and headlight. The vehicle is described only as a compact four door sedan, light blue or green, driven by an elderly white-haired white or Hispanic man. Anyone with information is urged to contact the department’s Cabazon Station at 951-922-7100. Prayers or good wishes are definitely in order. Thanks to Cleave Law and Tom Herman for the heads-up. Update: The Riverside Sheriff’s Department has made an arrest in the case. According to a press release from the department, a deputy assigned to Calimesa noticed a 2005 Ford 500 matching the description of the suspect vehicle, with damage consistent with the collision, parked in a driveway in the 1200 block of Cherry Lane. After towing the car to examine the evidence and talking with the owner, 42-year old Calimesa resident William Donald Johnson was booked for felony hit-and-run. Then again, Johnson had a full week to sober up if he had been drunk or otherwise under the influence at the time of the collision. Meanwhile, the victim, who has been identified on Facebook as Phil Richards, remains hospitalized following several surgeries. Thanks to Kevin for the heads-up. Update 2: I’m sad to report that, according to Don Davidson’s Facebook page, Richards died of his injuries at 5 pm on Saturday, January 11th. In somewhat better news, another hit-and-run driver is in custody as of Monday evening after he ran down a rider on an adult tricycle Monday afternoon. According to the Ramona Sentinel, 69-year old James Swift was riding south on Montecito Road at around 1:05 pm. He was crossing Main Street on the green light when he was apparently right-hooked by a 2002 Yukon Denali. Witnesses report the driver actually stopped and placed the stroke victim back on the seat, saying he was sorry before running back to his truck and fleeing as fast as he could. Fortunately, witnesses got the license number of the truck, and CHP officers were able to convince him to turn himself in. The 31-year old driver, who was not publicly identified, faces charges of hit-and-run and driving without a license. But at least he said he was sorry, right? 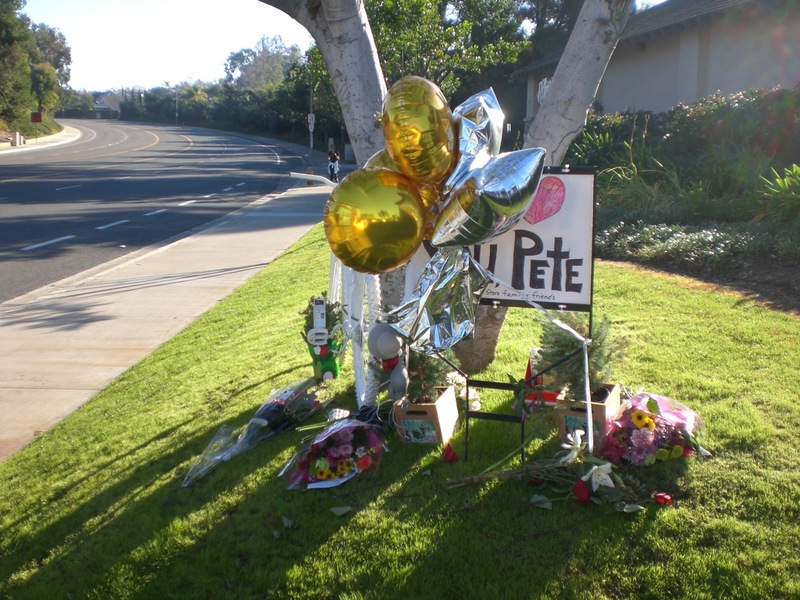 Finally, Ed Ryder offer moving photos of the ghost bike for Pete Tomaino, the popular 82-year old cyclist killed in Laguna Hills on Christmas Eve. The way this year has gone, maybe that’s a sadly appropriate note to end on.